I moved into my new place just one month ago and it’s been nonstop unpacking, painting, organizing and decorating ever since. I had lived in my last place for about 10 years so I was pretty settled in there and I haven’t done any serious decorating in a long time. My new place is a little smaller so I’ve tried to downsize as much as possible and only keep the things that I really love and are really useful. The projects have been a little overwhelming and this is actually the first thing I’ve sewn at the new place. (Confession: I’m a little worried that I haven’t started sewing sooner because my tv is no longer located in the sewing room. I’ve been spending more time watching tv and knitting than I used to. But I’m hoping to break that cycle soon.) Moving is so much harder than I remembered. I'm really looking forward to having a box-free house. So on to the project! I was looking for a rug for the bedroom to bring a little extra color to the space, and provide a buffer between the cold floor and my sensitive feet. If you’ve ever shopped for rugs then you know that the bigger they get the more expensive they get and boy can they get expensive. I wanted something light with a lot of colors and and stumbled upon the TANUM rugs from IKEA. I really love that these rugs are made from the leftover fabric from their bedlinen production. It makes me happy to be able to support repurposing in a small way. 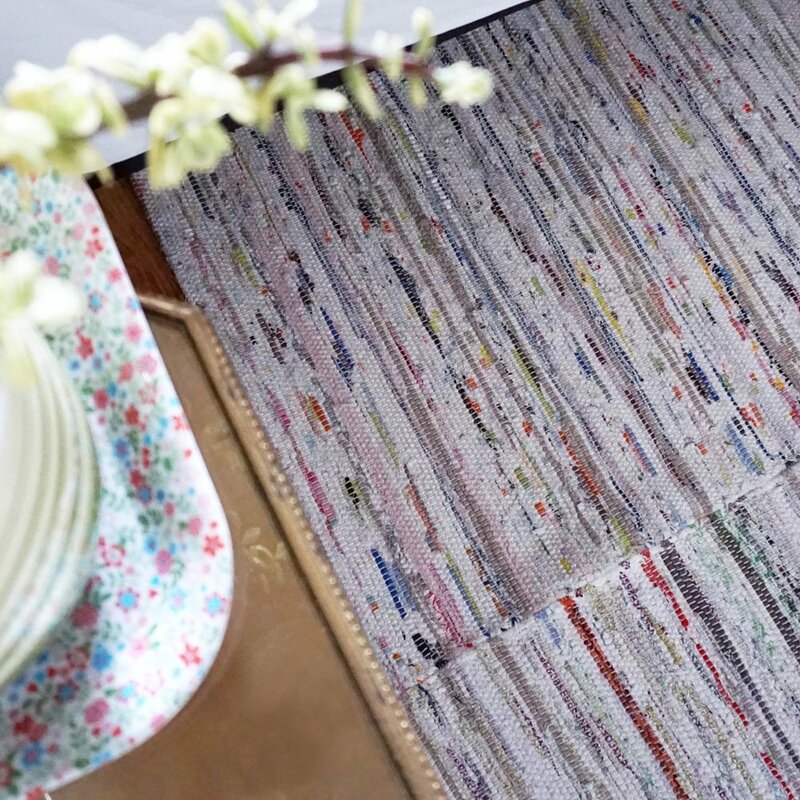 Because the rugs are made from repurposed material, each one is unique. The only problem is that the rugs are smaller than I wanted. They come in two sizes, a doormat size and a runner. I figured since the rugs are made from fabric, I’d have no problem just sewing a bunch together to make one big rug. My local store didn’t have any of the runners so I selected eight of the doormat size rugs. There is a lot of variety in the fabrics used and I really tried to select ones that were predominantly light in color. The rugs are pretty thick, especially at the ends but I was able to sew through them without too much trouble. The most challenging part was just the sheer bulk of the rugs. Setting up your machine on a large table would probably make it easier. I was inspired by rope baskets (see tutorials here and here) that are sewn together with a zig zag stitch. It’s so simple but fairly sturdy and the thread easily blends in with all the different fabrics. STEP 1: First, lay out the rugs and decide the arrangement you’d like them to be in. STEP 2: Thread the machine and insert the jeans needle. (I tried a few different heavy duty needles and the jeans (aka denim) needle worked the best. Set the machine to a zig zag stitch with 1.4-1.8 stitch length and the width to 7.0 (or as wide as your machine allows). I also used a walking foot to help move the rugs through. STEP 3: Even though these are pretty small rugs, they are rather unwieldy to stitch together. I devised a plan for stitching together eight rugs that minimizes the amount of bulk that you’ll need to feed through the narrow opening to the right of the needle. See above for my diagram. You can adapt this plan to your arrangement and the number of rugs you’re using. Select two of the rugs and roll the one on the right hand side so that it can fit through the machine. Untie the knots in the brown rope at the corners so that it will be easier to fit under the presser foot. With the tops aligned, position the rugs under the presser foot centering the gap between the rugs. Start stitching slowly and backstitch at the end. Continue stitching, feeding the rugs under the presser foot keeping the edges of the rug butted next to each other and centered under the needle. When needed, I used my left hand to gently pull the rugs at the back of the machine and pushed it with my right hand at the front. STEP 4: Repeat with the other rugs in the recommended order (or whatever works best for you). Anywhere that four corners met, I trimmed away the brown rope. For the brown rope on the edges of the new rug, I retied it and left it as is. As the rugs got bigger, I had a really hard time holding it on my desk so I moved to the floor and controlled the foot pedal with my leg. My machine became temperamental during one section but after repeated rethreading and a needle change, it started to work properly again. I found that some of the rugs were a little longer than others so I just eased them in where needed to get the ends to line up. I estimate that it took me about 3.5 hours to sew it all together, including the time with the finicky machine. And ta-da! The before and after shows what a difference a rug can make. I really love how the rug turned out and the casual look it gives to my bedroom. It's just a little bit colorful, lightens up the space and keeps my toes warmer. I'd love to hear if you try this out or have made other things with rugs.